I recently did a little interview for Newsround about the Copenhagen summit. They filmed it before the conference had started so I tried to be upbeat and optimistic about the outcome. As it turned out, the summit was a bit of a disappointment. 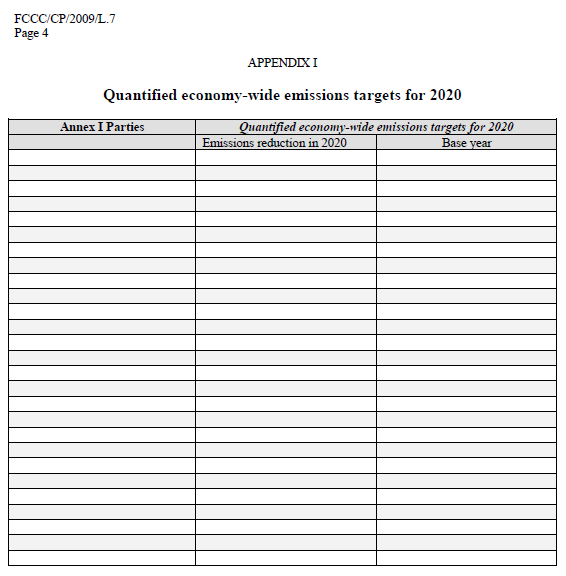 The Copenhagen Accord seems a bit lame, especially pages 4 and 5, which are a couple of blank tables shoved on the end. It reminds of the kind of thing you would do at school if you had no results but wanted to make your report a bit longer. In 1997 I’d just started my physics degree and was really interested in environmental issues. I followed the Kyoto negotiations. The big problem here was the unwillingness of the USA to ratify the agreement. Even before the protocol had been finalised, the US Senate had decided not to ratify anything that did not include binding targets for developing nations. This failure is not surprising given that the way members of the Senate fund their election campaigns – they are left with a responsibility to the interests of organisations who are resistant to big changes. Al Gore, as vice-president, nonetheless signed the protocol in 1998. I was an MSc student in 2000, studying environmental science at UEA. Knowing Bush’s background, his election seemed a big step backwards in the political negotiations regarding climate change. It was. Just as I was starting my PhD in Antarctic climate science, the 3rd report of the IPCC was finished. The high media profile given to the report was an inspiration for my work but one of the details in the report has been under intense scrutiny since 1998 when it was first published in Nature. The level of scientific and media analysis of this work must be unprecedented. The attempts to discredit the science and reputations of the scientists involved with the Hockey Stick graph has continued right up until the UEA email theft in 2009. However, the science has stood up to all the questions asked of it. These heat waves were one of the clearest signals of a changing climate in Europe and resulted in an estimated 30,000 deaths. 30,000! Most of these people were probably ill or vulnerable but the press coverage of this never seemed to reflect the scale of the disaster. 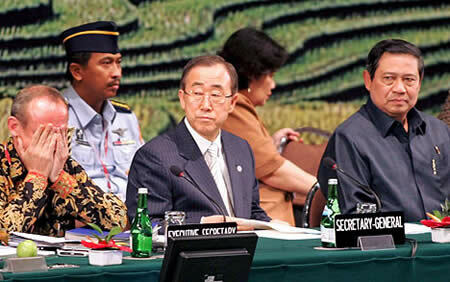 Maybe the 2007 UNFCC conference would result in a better outcome? Well, there’s Yvo de Boer (Executive Secretary of the UNFCCC) breaking down in tears at the final press conference. Not a high point. Ok, so Bali wasn’t so bad – some sort of agreement was cobbled together at the last minute but there was certainly no sense of pulling together. So why is this all going so badly? In 1987, with the Montreal protocol, World leaders managed to get together and solve the global CFC/ozone problem. That process happened quite quickly but how long will it be before the solution to the climate problem starts to even get on the right track? Will it be before the end of my career? Regardless, Copenhagen was not that point. I do the odd bit of science communication but I usually focus on my weather work as its more fun than climate change. That said, climate is obviously a really important issue and things are not looking good – that applies to the scientific findings, the political reaction or public opinion of the science. Here are a few thoughts on the later of these issues. The problem – what’s going wrong with climate change communication? The academic community is agreed (and justified in their view, despite the CRU emails theft) that our climate is changing and that the current change is almost certainly a result of the way our civilization developed. Things are also very likely to get worse. 1) “The real global warming disaster: is the obsession with ‘climate change’ turning out to be the most costly scientific blunder in history?” Christopher Booker. 2) “Heaven and earth: global warming – the missing science” Ian Plimer. 3) “An appeal to reason: a cool look at global warming” Nigel Lawson. 4) “Our choice: a plan to solve the climate crisis” Al Gore. 5) “Air con: the seriously inconvenient truth about global warming” Ian Wishart. 4 of these books question the mainstream scientific view on climate change with Al Gore’s book being the obvious exception. But only one is written by a working scientist, Ian Pilmer, and he is a geologist, not a climate scientist. The scientific arguments presented in these books are almost exclusively ones that have been around for years and have been proved wrong or not as important as claimed. They are Zombie arguments – no matter how many times they are shot down they get right back up and used again despite being plain wrong. Amazingly, Pilmer – the geologist – uses the “volcanoes produce more CO2 than humans” argument which should be easy for him to check. In short, these books are not scientifically reliable but are still published and bought in large numbers. One of the few credible books written about climate change from a sceptical point of view is by Bjorn Lomborg. He is an academic, an economist, and his discipline recognises books as a valuable publication in an academic career. Indeed, he has developed his media and academic profile via his books and conferences on global issues, not only looking at climate change. His arguments are valuable and need addressing even if they are not what most environmentalists would like to hear – dismissing people off-hand as ‘deniers’ runs the risk of giving them a Galileo complex and developing more public support. That said, though, another high profile economist, Sir Nicholas Stern, has also published an accessible book on climate change and takes quite a different view to Lomborg. Where are all the credible climate science books? There are several books that present the science well and try to glimpse into the future. The most optimistic is perhaps ‘The Hot Topic’ by Sir David King (co-written by Gabrielle Walker, a journalist). King is a scientist, a chemist, but was also Chief Scientific Adviser to the UK Government from 2000-2008 so knows a lot about climate science from that role. His opinion is that technological advances will play a big role in allowing us to combat climate change without a massive amount of hardship to individuals. This would be very nice but I’m not sure what the evidence behind this view is. Most other books on this topic are written by journalists (George Monbiot and Mark Lynas, for example) and are often towards the ‘we’re doomed!’ end of the climate change literature spectrum. This could, of course, be the way we are heading and it is certainly more likely than the ‘everything will be fine’ end. This style of book probably turns people off; no-one wants to hear about bad things that are quite likely to happen in the future. So where are the books by people working in this field? Well, Mike Hulme has written a book called “Why we disagree about climate change: understanding controversy, inaction and opportunity” – I’ve yet to read it but it sounds like an important contribution, if a little exclusive/academic. It’s pretty rare though. I’ve heard that Jim Hansen is working on a book too. Maybe the science is a little too dry or dated to make good popular science? The major breakthrough in climate science happened in the 1850s when John Tyndall discovered the warming effect of CO2 in the atmosphere. The recent big advances have been in the field of climate modelling on high performance computers. I think it would be quite difficult to write an engaging book aimed at a general audience on how important this subject is. In my opinion, though, the main reason that the vacuum exists is because most climate scientists have no career motivation to write such books. There is very little professional recognition for publishing anything other than papers in scientific journals. For a climatologist to put themselves on the line as the public face of academic climate research is not worth it in terms of career payback or the celebrity and potential backlash that would go with it. Climate scientists have engaged with politicians for many years and generally do not shy away for engaging with the media but, for the scientists at the coal face, there is little to gain from proactively engaging the public. The front cover of yesterday’s Daily Express is shown below. Oh dear. As an atmospheric scientist, I reckon I could come up with more than 100 real scientific reasons why Earth’s climate changes naturally. 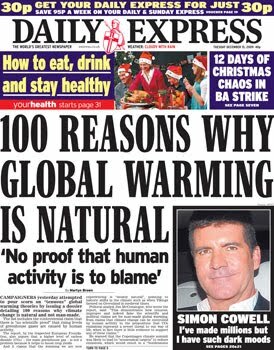 However, the Express article is more political than scientific and it doesn’t really reflect the headline. We have emitted millions of tonnes of greenhouse gases over many years. These gases block outgoing heat from the planet. 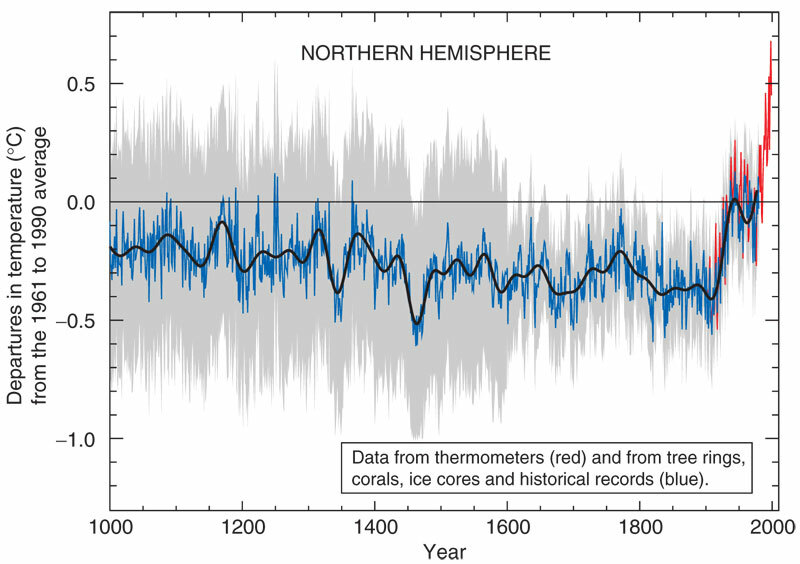 We have evidence of “unnatural” climate changes in the recent past and fully expect much more in the future. This point is not refuted by any of the 100 points given in the Express article. Where to start on climate change? Climate change usually only comes up in the media and online when there is some progress on a small detail or when something like Copenhagen or the UEA email theft happens. I think that this presents a big problem as the people consuming these stories might not know the basic science yet, these days, everyone is expected to have an opinion on climate change. This issue is amplified on the web where George Monbiot’s column on the Guardian website, for example, regularly receives more than 1000, usually anonymous and often controversial, comments. So I thought it might be a good idea to write a quick blog post for a complete climate science beginner. I’m only going to tackle two questions here, skipping over quite a lot of things, but they are the key points to understanding climate change. What are greenhouse gases and what to they do? All our planet’s energy comes from the Sun. Most of the radiation from the Sun goes straight through our atmosphere. When Earth absorbs the Sun’s radiation the planet heats up and then re-emits a slightly different type of radiation. The atmosphere can absorb this different type of radiation. This keeps some of the heat near the Earth like a blanket, or a greenhouse. The greenhouse effect is really important because without it the Earth would be much colder and our lives would be very, very difficult. Most of this science was known by about 1850 – we’ve been working on the details since then. How has the concentration of greenhouse gases changed? Ironically, also by about 1850, the Industrial Revolution had really got going and people were beginning to burn lots of fossil fuels and change the make up of our atmosphere. In particular, carbon dioxide was being released in great quantities. Our best measurements of CO2, however, didn’t start until the 1950s in Hawaii (see graph). 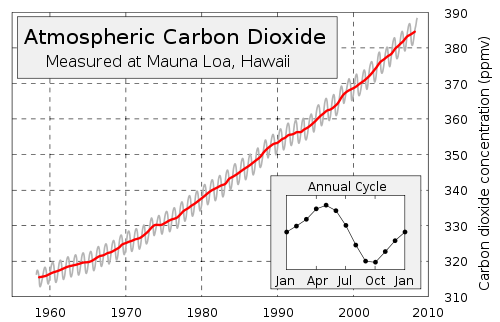 This shows a really clear increase in atmospheric CO2. This increase is having an affect on global temperatures because the greenhouse effect is keeping more heat in than it used to. This is the climate change problem described in its most basic form – more greenhouse gases lead to a change in the energy that is retained from the Sun. How this affects the Earth, though, is quite complicated (this why we talk about “climate change” more than “global warming” now) but the basic idea is quite simple. If you still want to know more then I would say that the best place to start, as far as reliability and lack of agenda is concerned, would be the Intergovernmental Panel on Climate Change – this is a scientific group, organised by the UN, who review all the science relevant to climate change. This is obviously a massive task but, nonetheless, they publish their reports in full online – the last science report came in at around 1000 pages long. This is clearly not very easy to get to grips with. However, the do produce a short and well written Summary for Policymakers that covers most of the big issues. Also, they produce a Glossary where you can find the meanings of any terms you don’t understand. I really hope that more people go and find out more about the interesting science behind our planet’s weather and climate!